Honeywell has made a habit of updating its air purifier every six months or so, and the Honeywell AirGenius 4 HFD310 is one example, as the ‘six-monthly’ update to the AirGenius 3 HFD300. Though being superseded by the AirGenius 5 HFD320, this air purifier is still good if you can bag one cheap on Amazon. So, are you ready with our today Honeywell AirGenius 4 HFD310 Review? As a big air purifier corporation in the world, Honeywell has released more than 30 specific air purifiers, with two biggest lines of products – the HPA Model and HFD Model. If the HPA Model is typically powerful with great True HEPA filter, especially featured in Honeywell HPA600B – latest flagship of this brand, the HFD Model brings a brand new ifD air filter. Now, let’s take a look in Honeywell AirGenius 4 HFD310 Review. Honeywell seems intent on sticking to its crazy-short air purifier refresh cycle, with the Honeywell AirGenius 4 HFD310 arriving just six months after its predecessor, the Honeywell AirGenius 3 HFD300. Given its speedy turnaround, the question is how much could Honeywell improve? The answer, not a great deal, it seems. 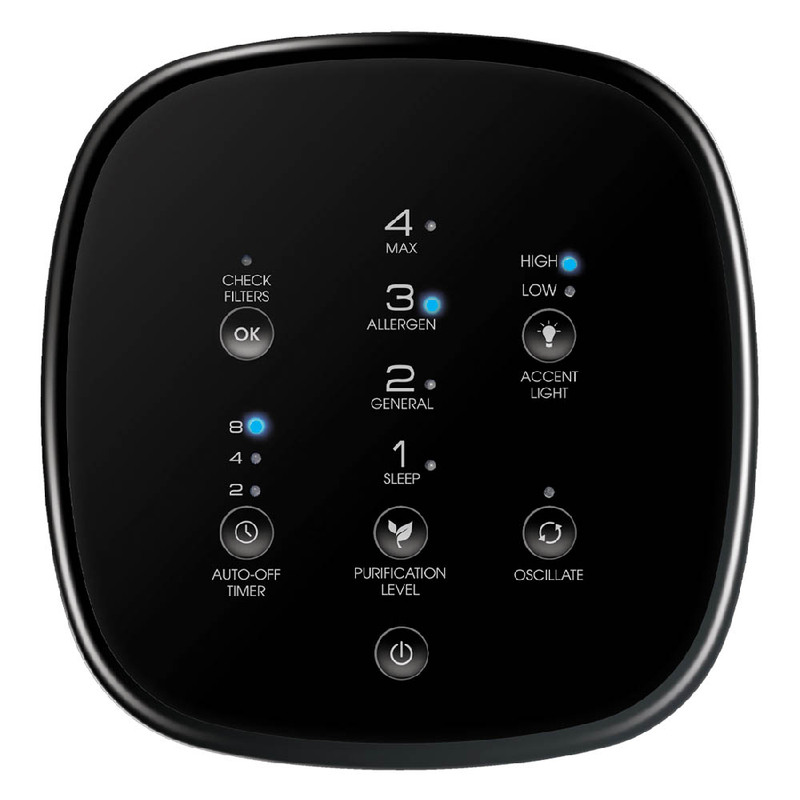 Honeywell AirGenius 4 HFD310 starts with $259, but reduces to only $197 due to its old age in 2019. However, you can still buy this air purifier from original Honeywell store, not like the predecessor AirGenius 3 HFD300. Again, thanks to Honeywell different product lines, we will have a better performance Honeywell HPA200 for the same price. This price range is also a playground for lots of well-known air purifier brands, such as Levoit LV-PUR131, or Coway AP-1512HH and even Winix WAC9500. With lots of strong competitors, will the Honeywell AirGenius 4 HFD310 still be your choice? If yes, we spare a deal of this Honeywell AirGenius 4 HFD310 for you below. Honeywell HFD310 – Honeywell AirGenius 4 Air Cleaner/Odor Reducer, Black Edition (with Energy Star qualified). Recommended for large rooms, 250 sq ft. 4 air cleaning levels: Sleep, General Clean, Allergen and Max for the best performance. With such short life cycle of the Honeywell AirGenius 4 HFD310, there is not much difference to expect from the previous HFD300. For looks, it’s not a radical departure from the HFD300, though the color is black and the air grills are much thinner. There is an attractive light at the bottom of this Honeywell AirGenius 4 HFD310, to differentiate with its predecessor. Just like any HFD Model air purifiers, Honeywell AirGenius 4 HFD310 makes use of a back-to-front air flow system. This air flow system is mostly for increasing the fan power and fitting its tower-size. With such height of 27 inches, Honeywell AirGenius 4 HFD310 is a typical tower air purifier to use. On top of this air purifier, Honeywell AirGenius 4 HFD310 has a slightly different control panel. Beside the common buttons in AirGenius 3 HFD300, there is one Timer button and one Dimmer Light button. Honeywell AirGenius 4 HFD310 keeps the same 13 lbs in weight, just like the predecessor HFD300. This weight will give you the comfort you need when move it around your home. As we stated earlier, Honeywell AirGenius 4 HFD310 is not a great deal of improvement compared to the AirGenius 3 HFD300. For the performance, Honeywell AirGenius 4 HFD310 is keeping the same 2-stage air filtration system with the core of ifD air filter. Pre-filter – Honeywell AirGenius 4 HFD310 uses a normal pre-filter. This pre-filter can capture larger particles before they enter the ifD filter. Also, the pre-filter is washable, and therefore, permanent. ifD filter – The Honeywell AirGenius 4 HFD310 uses an unique ifD filter to capture up to 99.9% of down to 0.3 microns contaminant particles like pet dander, mold, viruses, bacteria and pollen. This air filter adds an Activated Carbon filter to help deodorize the air and reduce the odors. Basically, the Honeywell AirGenius 4 HFD310 is the same HFD300 with more functions, so I don’t expect anything in its performance. It still has an ifD filter, which stands for Intense Field Dielectric. This technology is a breakthrough, permanent filtration method that is highly effective against all types of airborne particles which are larger than 0.3 microns. It works like an ionic air filter, and therefore, can emit a trace amounts of ozone. Sadly, with better functions, Honeywell AirGenius 4 HFD310 still doesn’t have an on/off button for ionic feature. If you have asthma or other breathing issues, you should stay away from this Honeywell AirGenius 4 HFD310. To test this air purifier, I put both the Honeywell AirGenius 4 HFD310 and Honeywell AirGenius 3 HFD300 in a room of 150 sq ft, and run them for one hour. Other samples to test the efficiency of Honeywell AirGenius 4 HFD310 are Honeywell HFD-010 and Honeywell HFD-120-Q. At first, I expected a better performance of Honeywell AirGenius 4 HFD310, but this air purifier has nearly the same efficiency against any 0.3 microns particles like its brother HFD300 – just only 90%. The efficiency of the testing samples were much lower, with 78% and 87%, respectively. If you need to put the efficiency of your Honeywell AirGenius 4 HFD310 further, I suggest that you should run your air purifier for about 2-3 hours. Again, Honeywell AirGenius 4 HFD310 has the same fan power as Honeywell AirGenius 3 HFD300. The room coverage is only 250 sq ft, which is mostly suitable with the medium rooms. The ACH of Honeywell AirGenius 4 HFD310 is 5x. With such high ACH rating, Honeywell AirGenius 4 HFD310 can clean your room every 12 minutes. The CADR of Honeywell AirGenius 4 HFD310 is 160 Dust/ 161 Smoke/ 170 Pollen (cfm). With a little improvement in CADR rating than HFD300, this Honeywell AirGenius 4 HFD310 is nowhere near the same fan power of Honeywell HPA300, or at least Coway AP-1512HH. There is one advantage for not having True HEPA filter in your air purifier – the silence of its fan. It’s really difficult for a good True HEPA air purifier to deliver a quiet noise level. Luckily, thanks to the ifD air filter, Honeywell AirGenius 4 HFD310 (and others in HFD Models) is really quiet. With only 4 fan speeds, the Honeywell AirGenius 4 HFD310 is a must-have air purifier in any quiet places, such as your office or bedroom. Honeywell AirGenius 4 HFD310 has the same power consumption as the HFD300, with maximum is only 38W. For doubling the fan power of the Best Seller in 2019 – Levoit LV-H132, this air purifier only consumes the same energy amount. Well, if you really need to reserve the energy, Honeywell AirGenius 4 HFD310 is good for you. For using a Honeywell AirGenius 4 HFD310 8 hours per day, it would cost you up to $14 per year. $20 is how you need to pay for more additional features, like Auto-off Timer and Accent Light functions. Also, you still have an unique oscillation function button and one LED indicator for filter replacement in this Honeywell AirGenius 4 HFD310. However, $20 can’t give you other modern functions, such as Smart Sensor or Wifi connectivity. If you are looking for these features, you should search for GermGuardian CDAP5500BCA or Blueair Sense+. These air purifiers are famous for their low-range smart features, but still as accurate and stable as other high-range ones. Honeywell AirGenius 4 HFD310 may be a good air purifier, but what you lose is too far acceptable for what you gain. Should you need a real deal for air purifying, Honeywell HPA300 is a better option is every aspect. Should I buy Honeywell AirGenius 4? If you have serious allergies or asthma to airborne pollutants: the Honeywell AirGenius 4 has an ifD air filter, which is not as good as the True HEPA filter. If you need a budget version of this air purifier: you should opt in for the Honeywell Compact AirGenius 4 or Honeywell AirGenius 3. If you care about the annual filter cost and energy cost: the Honeywell AirGenius 4 has the most affordable air filter for the price. If you love the additional features: you can select between the GermGuardian CDAP5500BCA, Honeywell HPA250B and Blueair Sense+ for both the Smart Wifi connectivity and Smart Sensor functions. Not to go for in 2019, especially when the True HEPA air purifiers from Honeywell are much better.